Freshwater fishing can be done almost anywhere in the world and at any time of the year. From catfish spearing in the mighty Mississippi to ice-fishing on an arctic pond to the quiet contemplation of fly-fishing in a pristine mountain stream, there are multitudes of ways to enjoy this sport. However, the way that you choose to fish is often based on the area where you plan to fish, and the species you want to target. Here is a brief look at some of the different kinds of freshwater fishing, where they are done, and the equipment that is needed. The kind of freshwater fishing that is done will depend on your location, the kind of water body where you want to fish, the species of fish you want, and the equipment to which you have access. This is one of the main forms of freshwater fishing, and it can encompass a number of different kinds of fishing, depending on where you are. Boats can be small rowboats, canoes, or kayaks where you fish on small ponds or on rivers, or you can have a larger boat like the kind that are used for deep-sea fishing, and fish on a large river like the Mississippi or a large lake. 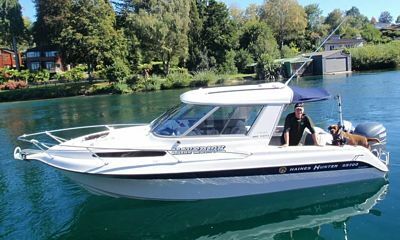 In some cases, a motor is necessary to keep the boat moving at slow speeds and attract fish, but in most situations, the boat is just a way to get to an access point in the middle of a river or lake to drop a line. Boat fishing is most often done with a rod and reel, and can range from trolling for Great Lakes salmon to bass fishing. 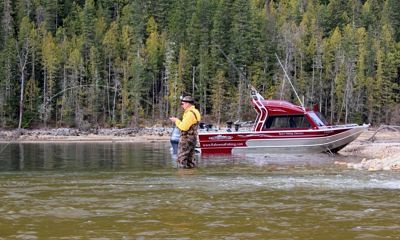 This kind of fishing requires you to stand in the water, most often in waders, and to cast your rod in a way that mimics a fly dancing on the surface of the water. Trout are a very common species that is caught this way, but they are not the only ones that can be snagged by fly fishermen. This form of fishing usually uses bits of string and feather that are tied to look like the larvae of local insects. Many fly fishermen tie their own flies, but they are also sold pre-tied. This kind of fishing requires a lot of technique and some knowledge of the local insect species. Fish may occasionally bite flies that do not fit the area, but the larger, older, wary fish usually need a pretty good imitation to be fooled. This is a popular pastime in northern climes, where water often freezes solid enough to drive on. This is most often (with some exceptions) done on lakes or ponds, because the moving water in a river, even a frozen one, leaves ice too thin to safely set up an ice fishing station. Ice fishing involves using a special hole-making tool, called an ice auger, to core through what can be several feet of ice and to the water below. Then a line and hook is placed in the hole. Often, several holes are bored, multiple lines are placed in an area, and a small, portable fishing shack is set up on the ice nearby to protect ice fishermen from the cold winds. Many of the species that are caught during the summer, like sunfish, bluegill, crappies, and bass are popular ice fishing trophies. However, it is also a great way to catch the more voracious and larger northern pike, which is a favorite sport fish of many. For those who do not have access to a boat or for those who want an easy way to introduce kids to fishing, dock fishing is a great way to learn. The shade that small docks provide are often popular cover for small fish who are at risk from birds. Because of this, fish congregate here, and it is a great place to drop a line with a worm and learn how to cast a fishing rod and hook a fish. As a basic rule, the shallows most often have smaller fish than deeper water, and this is not always the best way to trophy fish. However, as a beginner’s fishing experience, a stationary place like a dock, pier, or bridge is a great way to develop a love of fishing. Some places find that spearing fish is a great way to get to some of the large river fish that may not go for a baited hook. Catfish and frogs are two popular species that can be caught this way. Frogs are often speared on a long-handled pitchfork-like tool, and the practice is called gigging. Catfish can also be caught with bare hands, often with the fisherman sticking his whole fist into the catfish’s mouth. This kind of fishing is called noodling, because your fingers become the bait, wiggling around like noodles. Since southern catfish can grow quite large, it is not unusual for noodlers to find catfish weighing between 50 and 100 pounds. The fishing purists will tell you that all you need is a rod, reel, hook, and the right bait. Others will tell you all about the latest technological innovations that come with fishing. Like fishing technique, what works best for one person may not be the solution for another, and much of it varies by species, location, and water type. Here are some of the basic equipment, and some things to consider when you choose your own. Who is eating your bait: The eating habits of the fish you are targeting should have a lot to do with the bait you choose. Some fish, like carp, are indiscriminate eaters, and will grab anything that looks like it will fit in their mouth, while others, like trout, are rather picky, and may only bite at the favorite species of their favorite variety of food. Live vs Artificial: Often, this debate comes down to personal preference. Artificial bait is more expensive, but reusable. It can emphasize things a fish is drawn to, like bright colors, glow-in-the-dark, or metallic shine. However, it will not pass a nibble test, and if you give a fish the real thing, you do not need to try and fool them. Of course, dead flying insects are hard to use as bait, and so in some cases, the choice is clearer than with others. How Many Kinds: Everyone has seen the fisherman with the tackle box full of hundreds of different bait choices. This makes it hard for a beginner to know how many kinds of bait to carry. It is not a bad idea to have a few options, in case no one is biting your first choice. However, before you buy everything in the store, speak to someone with experience about their top three or so recommendations for your target species. The rod you choose will also depend on the kind of fish you want and the kind of fishing you plan on doing. Fly fishing rods are different than boat fishing rods. Also, the length of cast, the size of person fishing, and the size and weight of fish you plan on catching are all factors that you must consider when you choose the kind of pole, the gauge of fishing line, and the type of reel that will suit you best. Nets are a great addition if you are catching larger fish or fish with a reputation for putting up a good fight. Often, fish will change the way that they wiggle when they are lifted from the water to the air, and you may find yourself losing your prize just at the last minute. By having a net in place under the fish as you bring it out of the water, you give yourself a little insurance that this prize is yours to keep. Sonar is a great way to know what is under the water in some situations. However, if you are in an area with a lot of underwater vegetation, you will get a lot of false positives on fish. Deeper lakes are the best freshwater use for fish finders, though some who have taken the time to learn to read them will swear by them in other situations. As they can be a costly investment, it is not a bad idea to wait until you are in love with the sport of fishing to decide if they are worth purchasing. Whether you like the taste of fresh fish, the pride of catching your own food, or the feeling of victory over the elusive large species in your area, fishing is an enjoyable pastime for many people. It is a fun and easy thing to learn the basics of, and there are enough nuances that many people find themselves learning more about it for the duration of their lifetime. No matter your reasons for trying to freshwater fish, it is a great excuse to be out on the water.